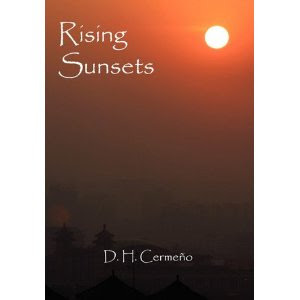 Rising Sunsets was written by D.H. Cermeño. I received an e-mail a couple of months ago with the subject "Message from a new author". I was excited to read that the author of Rising Suns was asking if I'd like to read his book. The synopsis sounded interesting... and on reading the brief author bio I found he lives in the same Florida town where my brother's family lives. I was also going to be visiting my brother the week after I received the e-mail. (What can I say... I like random coincidences.) So... I e-mailed back to ask for a copy of Rising Sunsets. "David Fletcher suddenly realized he doesn't know what he's going to do with himself after graduation. On a rather spur of the moment whim he signs up to teach English in Japan. He's quickly swept off to a new life in a new country." course of his life is changed forever. I have never been to Japan, and I loved seeing it through David's eyes. There were so many details included in a relatively short novel. The descriptions of the countryside as he first sees the flowering cherry blossoms are just breathtaking. I loved the interactions between David and his co-workers and students. The way he described his introductions to Japanese culture and community left me in awe but with anxiety. He made me feel what a struggle it must have been to find a balance with those who accepted his presence as an American bringing diversity... and those who fought against him as an outsider. I'm quite impressed with how deeply he was able to touch on culture, romance, love and family. I want to compare the novel to a journal. It wasn't written in the style of journaling, but it had a very personal feel to it. I read a review (I should never do that before finishing my own) that complained that the story bounced around... but it felt very natural to me. It read like I sometimes find myself thinking. You'll be going through your day... and you're suddenly reminded of something else. Something someone says to you will make you think back to something your mother used to say. It all flowed for me. I WAS left with some questions. Actually... mostly... I really am just left wondering how much of the story is fiction and how much is biographical? There are similarities between the author and the novel... both taught English in Japan after graduating... both graduated with a degree in broadcasting... both seem to have a love of Japan. Did the author really have to deal with his own Yamaguchi? Did the author actually climb Mount Fuji? And... most importantly... is there a Yoshie???? I think my questioning these things just makes me realize how real Cermeño's writing made his characters and story. Whatever the answers are... I just want to say right now... I want a second novel. The moment I finished reading I wanted to know what happened next. Whether any of the story is "real" or not, I need to know what happens after that epilogue.